Quantifying individual specialization and other forms of intraspecific ecological diversity can reveal variation that is critical for evolutionary or behavioral adaption of a species to changing environments. Here, the isotopic niche and degree of individual foraging specialization were quantified for an endangered seabird, the Hawaiian petrel (Pterodroma sandwichensis), nesting on Lānaʻi (20°48′N, 156°52′W) and 72 km away on Haleakalā, Maui (20°42′N, 156°15′W; 20° 43′N, 156°14′W) between 2006 and 2011. Stable isotope values (δ13C and δ15N) from sequentially grown flight feathers provided time-series data that reflect the foraging habitat (relative latitude, nutrient regime of foraging location) and diet (trophic level) of individual birds across the period of molt. The two colonies differed in mean δ15N and δ13C throughout the period of molt, total nitrogen isotopic niche width, and extent of individual specialization with regard to δ15N. It is likely that petrels from Lānaʻi and Haleakalā use different feeding locations during the non-breeding season, when they are no longer tied to closely spaced breeding colonies. The loss of either colony could result in a substantial, long-term reduction in ecological diversity of the species (and perhaps, in adaptability). In contrast, comparisons of measured versus null specialization indices strongly suggest that both Lānaʻi and Haleakalā populations consist of individual generalists. 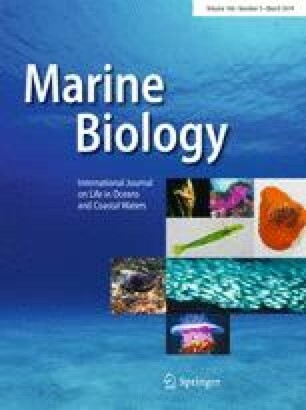 Individual generalization with regard to foraging habitat and diet is here predicted to be common among tropical and subtropical oceanic seabirds. Such generalization could facilitate rapid, population-level responses of seabird species to marine environmental change via individual plasticity. Reviewed by F. R. Ceia and an undisclosed expert. The online version of this article ( https://doi.org/10.1007/s00227-019-3483-7) contains supplementary material, which is available to authorized users. We thank the Bird Division, National Museum of Natural History, for access to and assistance with specimens. We also thank Haleakalā National Park and the Hawaii Department of Land and Natural Resources (Division of Forestry and Wildlife) for facilitating sampling of salvaged Hawaiian petrels. Funding was provided through Peter Buck and Stable Isotope Postdoctoral Fellowships from the Smithsonian Institution. All applicable international, national, and institutional guidelines for the care and use of animals were followed. Salvaged seabird carcasses were collected under the Endangered Species Act permit TE-145562 and the cooperative agreement between the Hawaii Department of Land and Natural Resources and the US Fish and Wildlife Service. Funding was provided by National Museum of Natural History, Smithsonian Institution.